Not only can we fill your bulk tanks at your location on your schedule, we can also provide you with storage tanks of various sizes for no additional charge. You’ll enjoy the benefits of 24 hour dispatch, lower operating costs, state-of-the-art equipment and a partnership that always puts your fueling needs first. We serve the diesel fuel needs of large and small fleets, farms and the agriculture industy in Ventura and Santa Barbara counties. 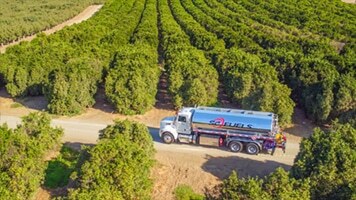 SC Fuels fleet of fuel trucks deliver gasoline, diesel, and tax-exempt diesel to farms and diesel fleets near and around Ventura, CA. Be assured the gallons of diesel fuel your company receives is accurate to the tenth of a gallon and as always is Weights and Measures Certified. Delivery tickets are printed out, not hand written; our trucks are GPS monitored at all times so you can be confident the delivery was made to your tank. 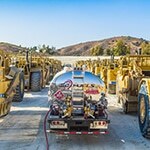 SC Fuels specializes in delivering fuel to underground and above ground storage tanks, pumps, generators, booster pumps and construction equipment. If you need a place to store diesel fuel purchased from SC Fuels; we offer above ground fuel tank loans for both short and long term needs. 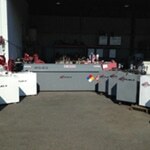 You can get either 500 or 1000 gallon above ground fuel tanks (ABT) placed by your farm or fleet.